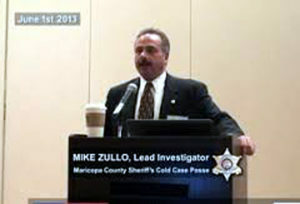 Lead Investigator Lt. Mike Zullo. He filed an affidavit on May 14, 2013 to the Supreme Court of Alabama which chronicles much of the evidence he has compiled thus far. In particular, he depicts a two-day meeting of investigators, attorneys, and information technology professionals, including Mara Zebest, a nationally recognized computer expert.